Magma is extremely hot liquid and semi-liquid rock located under Earth’s surface. 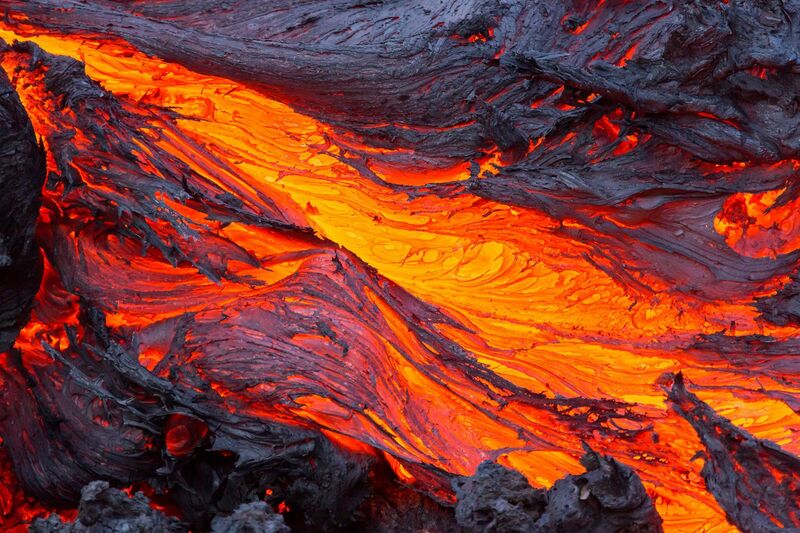 When magma flows onto Earth’s surface, it is called lava. Lava (magma that has erupted onto the Earth's surface) is visually mesmerizing – as the molten rock flows downhill, lava exposed to the air cools to a deep black color, while the molten rock beneath glows bright orange. Magma is extremely hot liquid and semi-liquid rock located under Earth’s surface. Earth has a layered structure that consists of the inner core, outer core, mantle, and crust. Much of the planet’s mantle consists of magma. This magma can push through holes or cracks in the crust, causing a volcanic eruption. When magma flows or erupts onto Earth’s surface, it is called lava. Like solid rock, magma is a mixture of minerals. It also contains small amounts of dissolved gases such as water vapor, carbon dioxide, and sulfur. The high temperatures and pressure under Earth’s crust keep magma in its fluid state. There are three basic types of magma: basaltic, andesitic, and rhyolitic, each of which has a different mineral composition. All types of magma have a significant percentage of silicon dioxide. Basaltic magma is high in iron, magnesium, and calcium but low in potassium and sodium. It ranges in temperature from about 1000oC to 1200oC (1832oF to 2192oF). Andesitic magma has moderate amounts of these minerals, with a temperature range from about 800oC to 1000oC (1472oF to 1832oF). Rhyolitic magma is high in potassium and sodium but low in iron, magnesium, and calcium. It occurs in the temperature range of about 650oC to 800oC (1202oF to 1472oF). Both the temperature and mineral content of magma affect how easily it flows. The viscosity (thickness) of the magma that erupts from a volcano affects the shape of the volcano. Volcanoes with steep slopes tend to form from very viscous magma, while flatter volcanoes form from magma that flows easily. fine-grained igneous rock containing large amounts of silica.